The Bank of Israel have launched (24th January) a new numismatic series entitled “Views of Israel” which will feature various scenes not often seen by visitors or not usually thought of when thinking of Israel and the region. The series will take you on a delightful and perhaps never before seen tour of some of the most interesting and scenically beautiful views in Israel, starting in the south at the Coral Reef in the Gulf of Eilat presented on a gold and silver three coin set. The Coral Reefs in Eilat are among the most beautiful reefs in the world. Their unique features are the result of a combination of factors, including the structure of the Gulf of Eilat, its geological history, climatic and oceanographic characteristics. Together, these have led to the development of rich and diverse Coral Reefs, resembling magnificent “underwater gardens”. Hundreds of coral species, as well as thousands of different species of fishes and marine invertebrates, decorate the reef, creating an array of colors and a marine ecosystem unparalleled anywhere else on earth. The Coral Reefs in Eilat are characterized by their structural and biological complexity, providing a habitat for thousands of species that live together in perfect reciprocal interaction. Designed by the artist Galia Erez, the images on all three denominations are uniform and present the natural splendor of the Coral Reef with its exotic corals, fishes and water life. The harmonious designs on both sides of the coin evoke the rich, enchanting underwater world. 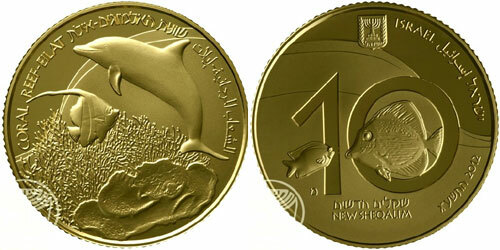 The coin’s obverse shows an artistic composition of coral, dolphin and fish on a background wave design, representing the Coral Reef in Eilat, with border inscription “Coral Reef – Eilat” in English, Hebrew and Arabic. The reverse includes the Israeli State Emblem and the text “Israel” in English, Hebrew and Arabic, the Mint Year and Mint Mark (star of David for the proof-like coin, the Hebrew letter “mem” for the proof versions). Fishes move around the figures of the Face Value in the center and in the upper area, is a wave-shaped design. Struck by the Mint of Norway (all three coins) on behalf of the Bank of Israel, the gold proof quality coin with a denomination of 10 Sheqel is struck in .917 fine with a weight of 16.9 grams and a diameter of 30 mm. A mintage of just 555 examples has been authorized The 2 Sheqel coin is struck in proof quality is minted in .925 silver with a weight of 28.8 grams and a diameter of 38.7 mm. A mintage of 2,800 pieces has been authorized. The 1 Sheqel proof-like silver coin is minted in .925 fine with a weight of 14.4 grams and a diameter of 30 mm. A mintage of 1,800 coins has been authorized. The Israel Coins and Medals Corporation, who are the official distributors of the coins offer the choice of each coin sold separately, a three coin set or a two coin silver set. For more information on these and other coins offered by the ICMC, please visit their website at: http://www.israelmint.com/?section=43855 the information is offered in English – international orders are fulfilled.